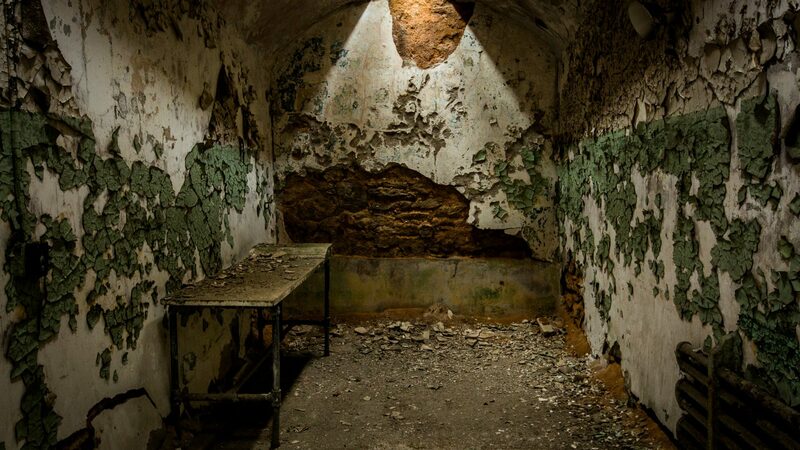 Al Capone‘s holiday home, the world’s first penitentiary, and one of America’s most (allegedly) haunted places: Philadelphia’s Eastern State Penitentiary is as infamous as its former residents and current ghosts. Photographer Susan Portnoy steps into one of the world’s most notorious prisons. 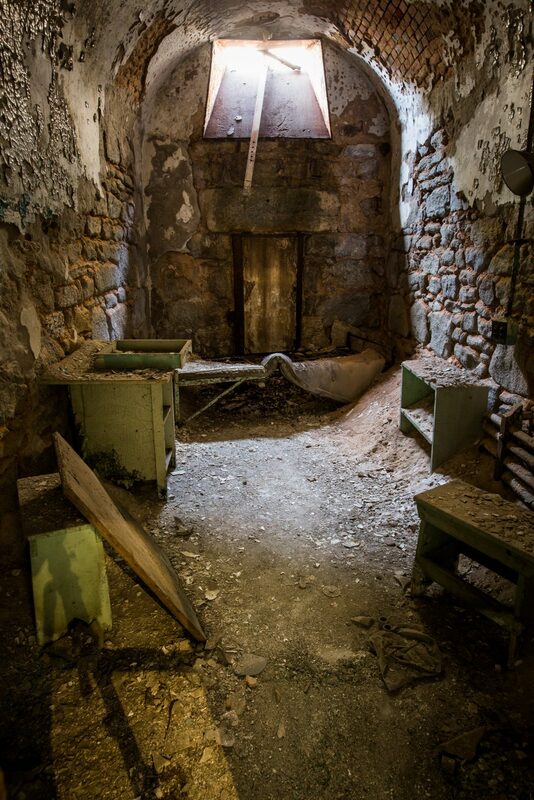 When Eastern State Penitentiary (ESP) opened in Philadelphia in 1829, it was one of the first buildings in America to have central heat and running water—even the White House couldn’t say the same. Its massive stone facade resembled a castle and it had walls 20 inches thick. Prisoners were kept in strict solitary confinement, forbidden to speak to anyone but the chaplain and cellblock guards. 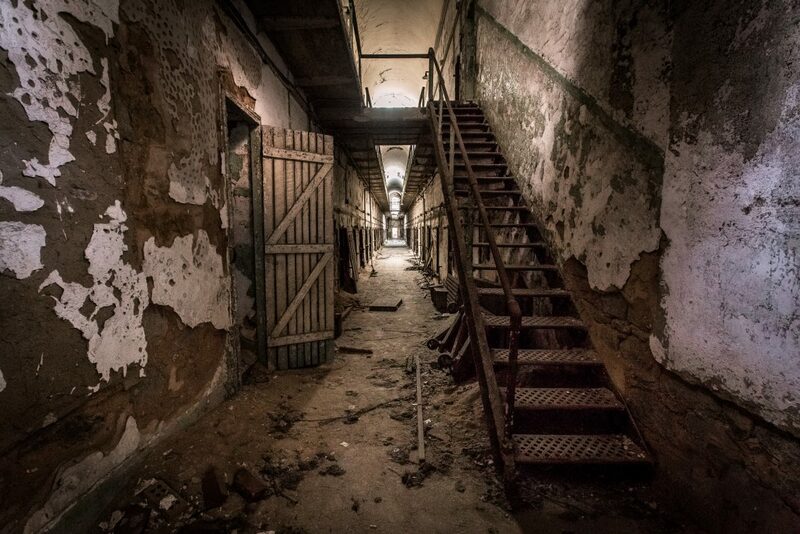 Over the years, gangsters such as Al Capone and ‘Slick Willie’ Sutton called Eastern State home, and many of them made headlines trying to escape. 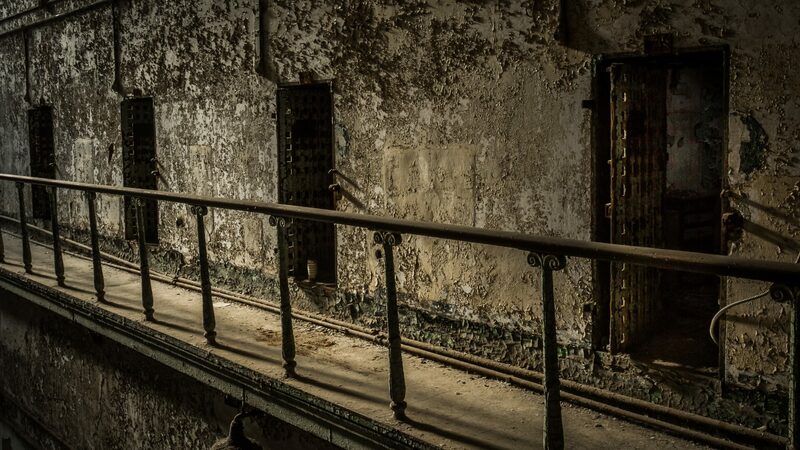 Today, the penitentiary is a fascinating, preserved ruin; both a photographer’s dream, and a casualty of abandonment and neglect turned into historic landmark and attraction. Not to mention…people swear it’s haunted. Cellblock one’s soaring arched ceiling resembles a chapel; and its seemingly endless line of sliding wood doors bring to mind a stable. Yet for over a 100 years, men were housed here and in the beginning, inmates were served through feed holes in the masonry. The doors weren’t added until the 1850s. 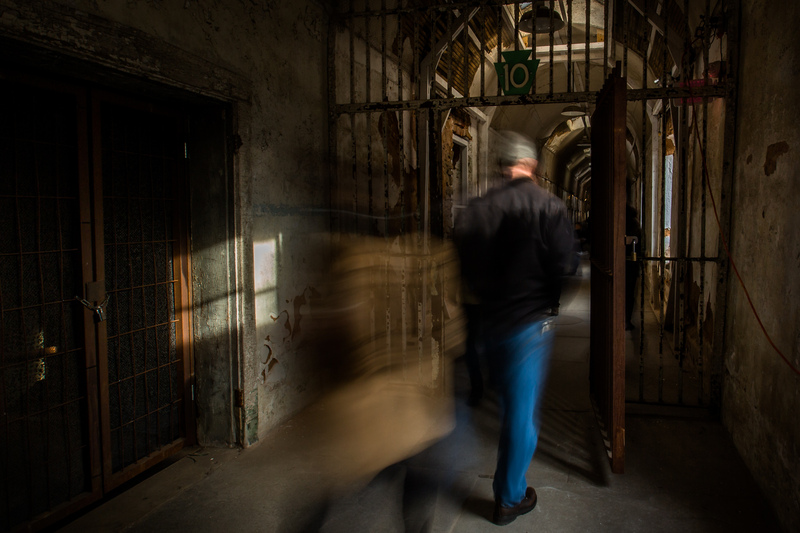 Built in answer to an unruly prison structure with no goal of redemption, Eastern State’s ideology, known as the Pennsylvania System, was based on the premise that people were inherently good. 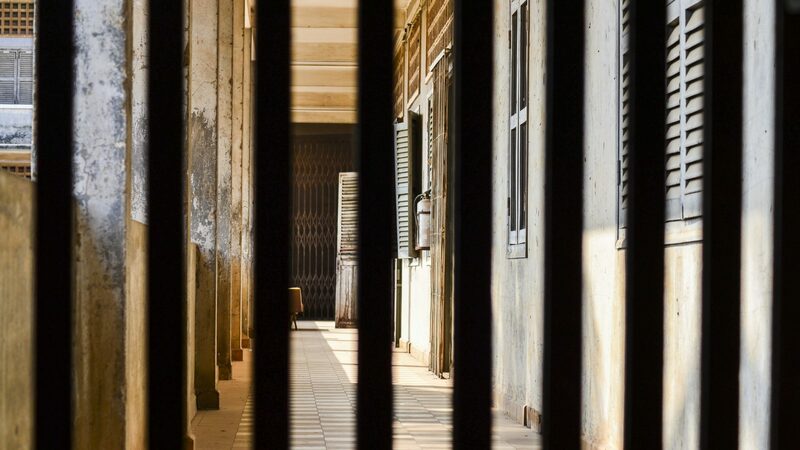 Leaders believed that if subjected to solitude and quiet reflection, criminals could become penitent and this in turn would lead to rehabilitation. 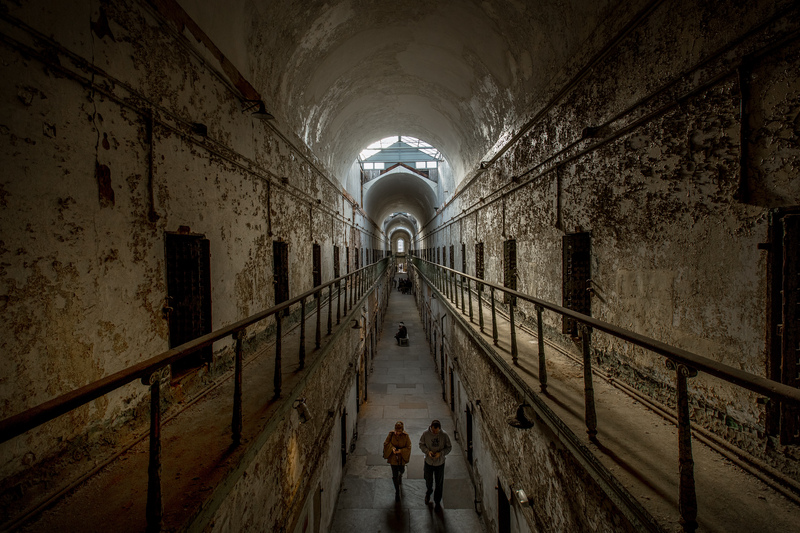 The term ‘penitentiary’ originated with Eastern State. 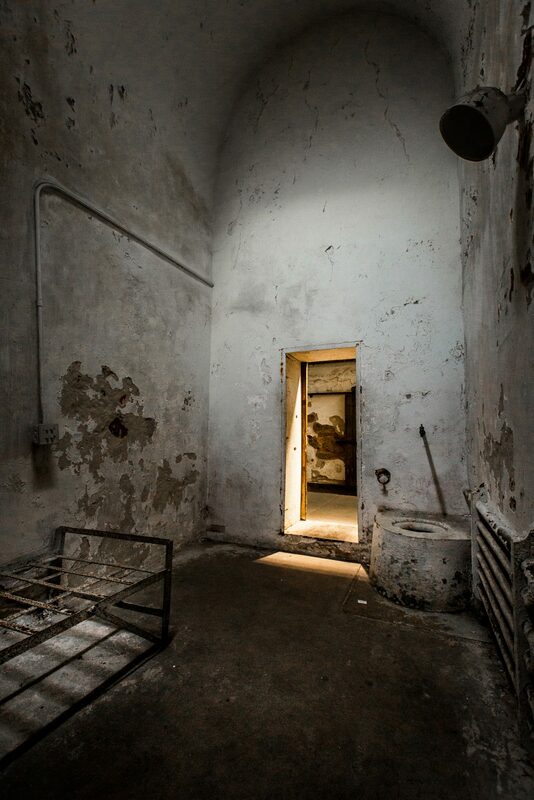 A rusty bed frame and the remains of a cast-iron toilet are all that’s left in this cell that’s open to visitor exploration. 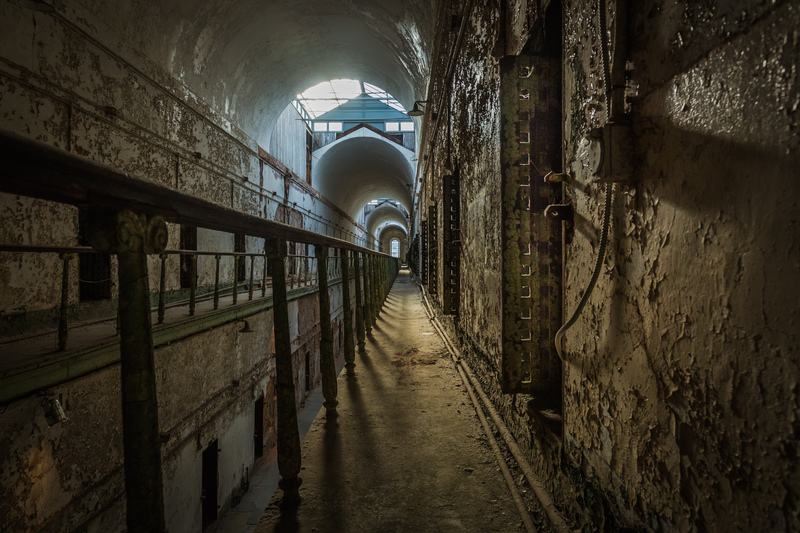 A child-sized door at the back of the room (not shown), long since boarded up, used to lead to an individual exercise area open to the sky and was the cell’s original entrance. A small, round skylight referred to as the ‘dead eye’ or ‘Eye of God’ towered overhead. Prisoners spent 23 hours a day in their cells with only two, half-hour exercise breaks. Every two weeks, they were taken from their cells to bathe—but were forced to wear hoods so they couldn’t see where they were going or catch a glimpse of another inmate. Prisoners caught speaking were swiftly punished. Some were left in a dark cell and fed bread and water, while others were confined to a strait jacket and gagged. The prison’s first design called for seven, one-story cellblocks. But by 1836, four, two-story additions with 30-foot barrel-vaulted ceilings were completed. 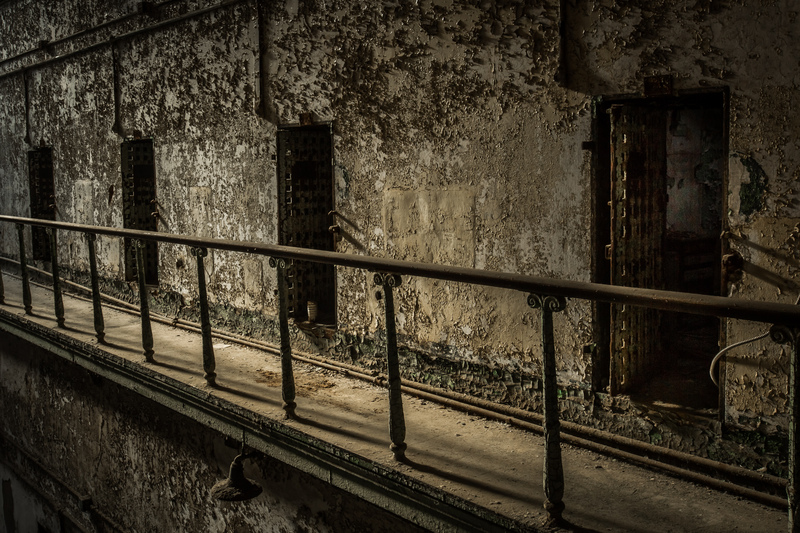 More cellblocks were added in subsequent years, but without the penitentiary’s signature arched ceilings and skylights. Women were housed in cellblock two for nearly a 100 years. In 1923, Freda Frost, convicted of poisoning her husband, became the last female inmate to leave the prison. 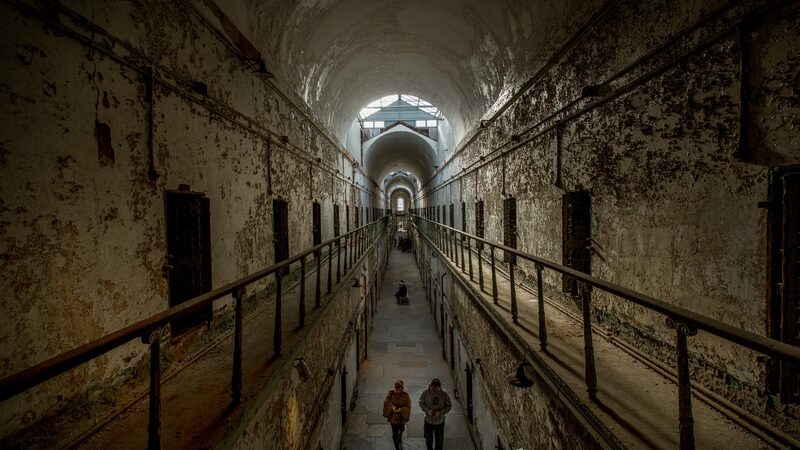 Walking through the prison’s crumbling halls, it’s easy to understand why people believe Eastern State Penitentiary is haunted. 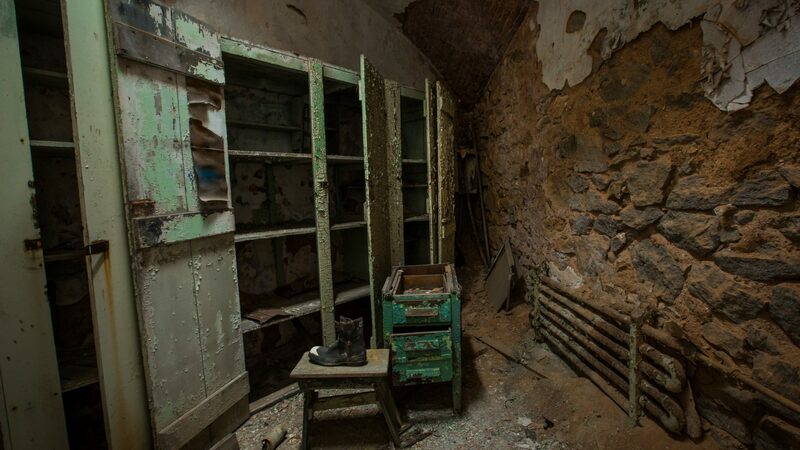 However, tales of ghosts and strange occurrences were reported as far back as the 1940s, long before Eastern State was abandoned. 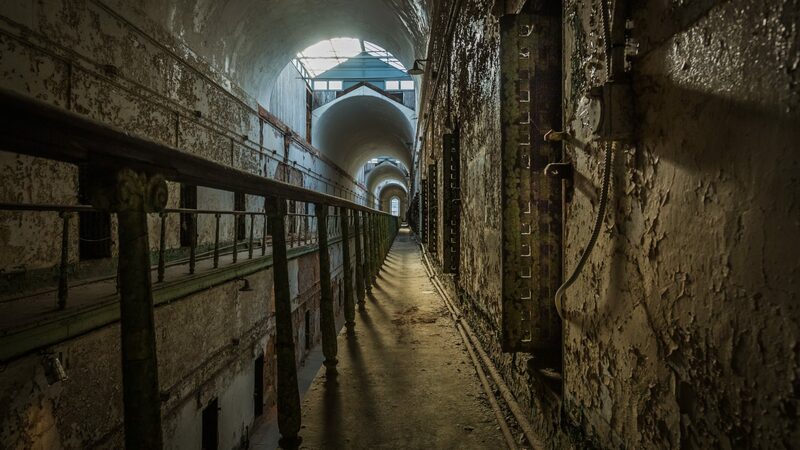 Not surprisingly, the penitentiary has been studied exhaustively for paranormal activity (experts say it does exist) and it was featured on the Travel Channel’s Ghost Adventures and Most Haunted Live, Syfy’s Ghost Hunters and MTV’s Fear. In 1929, five years before Alcatraz opened and where Capone would be transferred to, he spent eight months of a one-year sentence in Eastern State for carrying a concealed weapon in a movie theater. The room was decorated to Capone’s demands according to a newspaper description written in The Philadelphia Public Ledger on August 20, 1929. The article suggested that Capone was allowed luxuries others were not, though the warden denied the report. Luxuries included an armchair, Oriental rug, decorative lamps, a radio (he loved to listen to waltzes), and an armoire, in addition to other creature comforts. 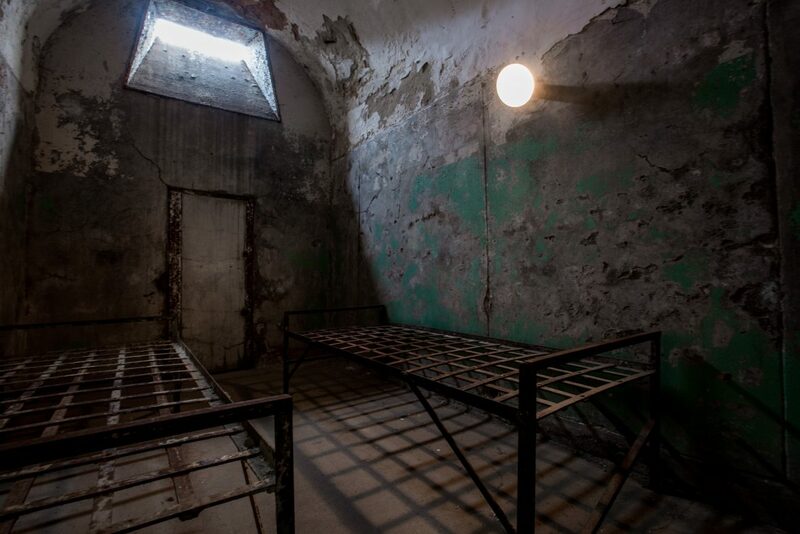 In 1913, solitary confinement was rescinded; less for philosophical reasons and more for the need for space. 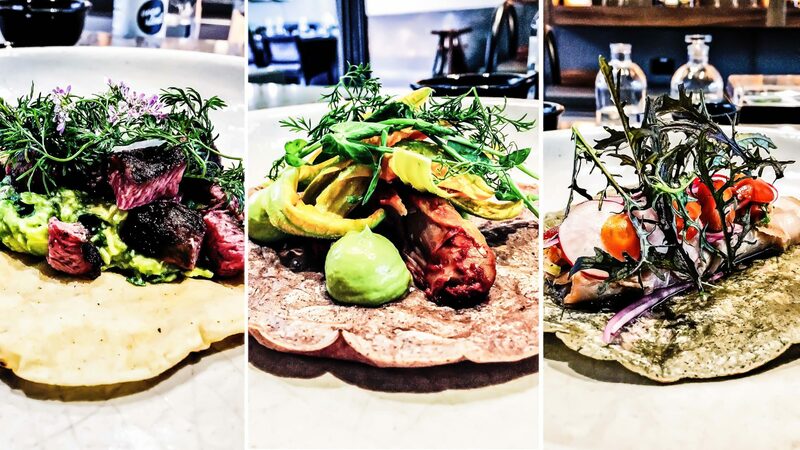 A mess hall was built in 1924 and for the first time, prisoners ate together. By 1926, after numerous additional cellblocks were built, Eastern State’s population had grown from 250 to 1700. 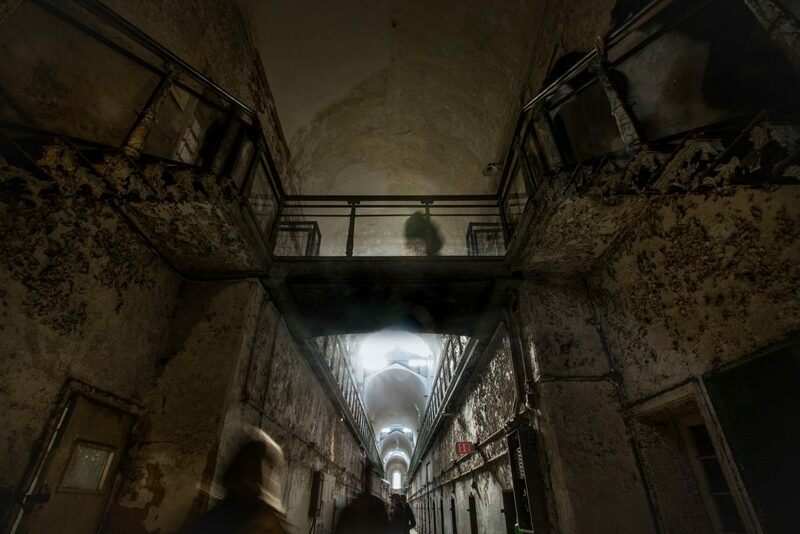 Over 100 prisoners tried to escape from Eastern State. 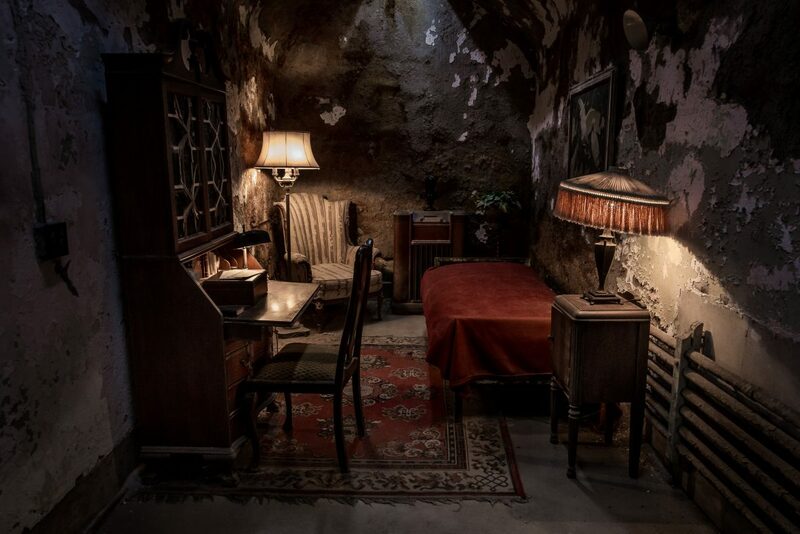 One of the most famous attempts was in 1945 when Clarence Klinedinst, a plaster worker imprisoned for burglary and other crimes, managed to dig a tunnel 127 feet long that came out on the far side of the prison wall. (You can see the hole above to the left.) The tunnel was supported by wood bracings and had electric lighting. Ten men escaped with Klinedinst on the morning of April 3rd, but all were captured soon after. 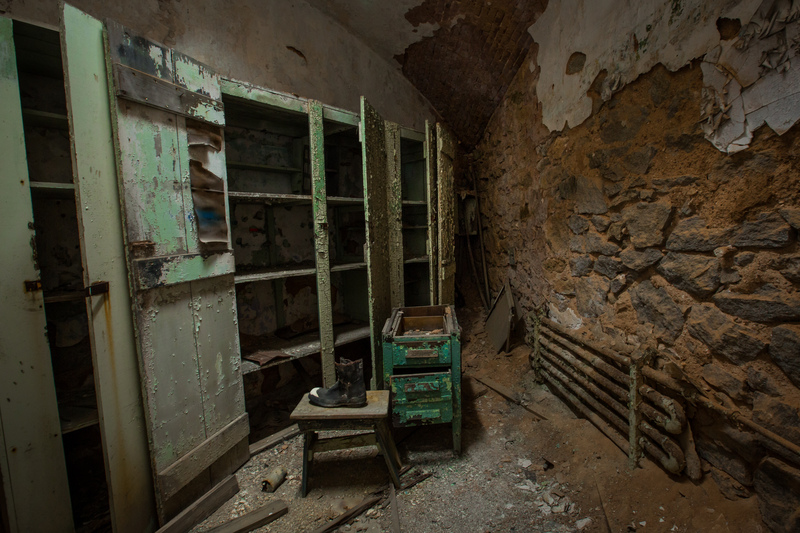 If Eastern State seems familiar, it’s understandable. 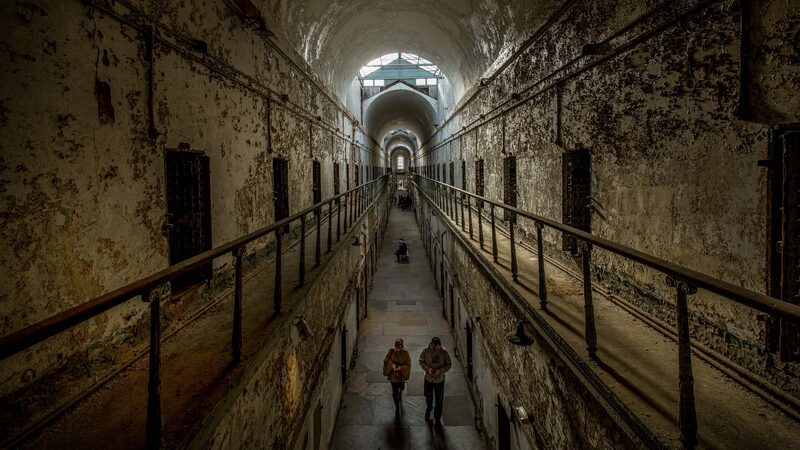 Hollywood has used Eastern State Penitentiary countless times as a setting for TV shows, music videos, documentaries and films including Twelve Monkeys (as an insane asylum) and Transformers: Revenge of the Fallen. 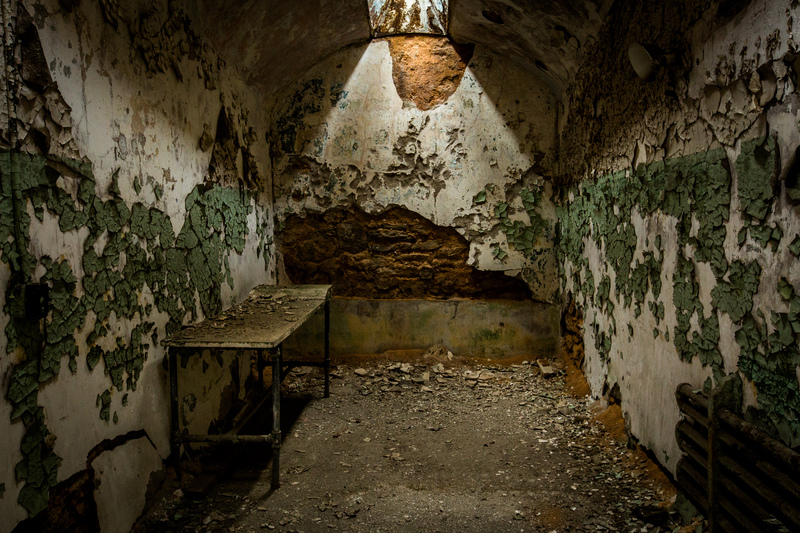 By 1971, the aging prison was obsolete, and it was left to weather the elements and fall prey to vandals for almost 20 years, virtually forgotten. In the ’80s, ideas were discussed for commercial use, but preservationists and city leaders believed in its historical value and instead raised money to make it safe enough for visitors. 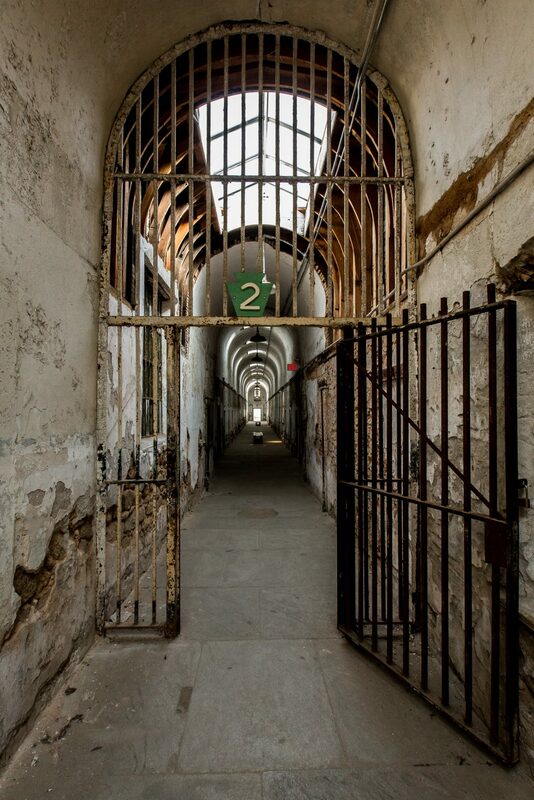 In 1994, the penitentiary opened its doors for public tours. 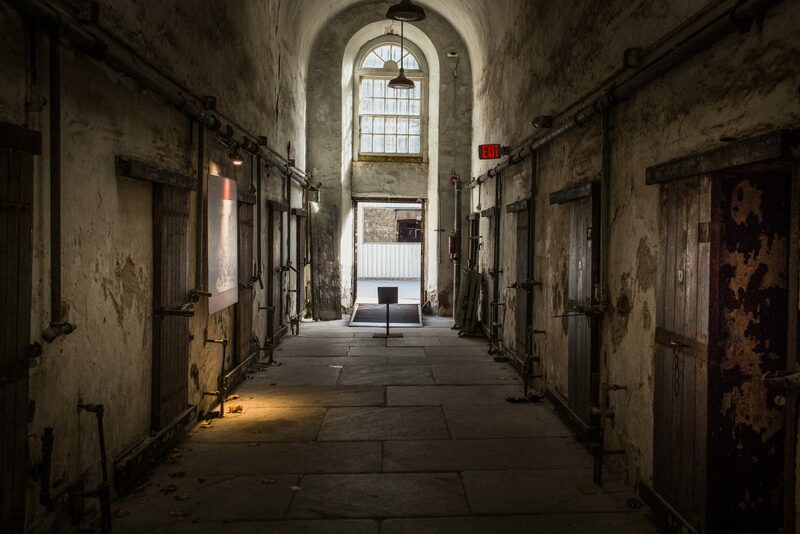 Take advantage of the free ‘Voices of Eastern State’ audio tour. Narrated by Steve Buscemi of Boardwalk Empire fame, who also shot his film Animal Factory in the prison, the audio includes clips from historians, former guards and inmates of the penitentiary. Save $2 per ticket by by purchasing tickets in advance online. 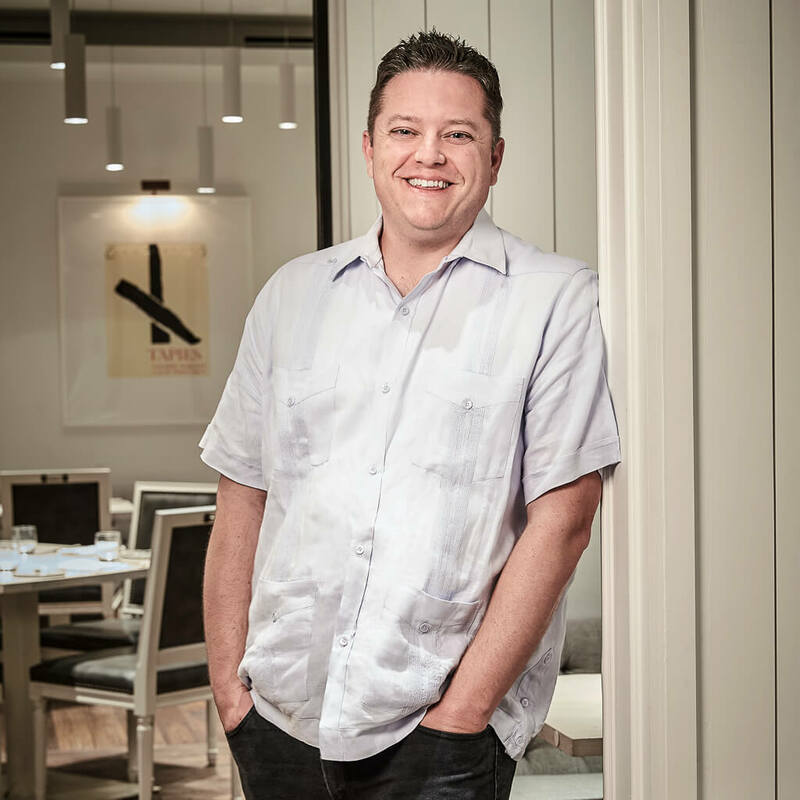 At the door: Adults $16, $14 for seniors, $12 for children 7-12. Eastern State allows photography (no videography) during public hours with some limitations. 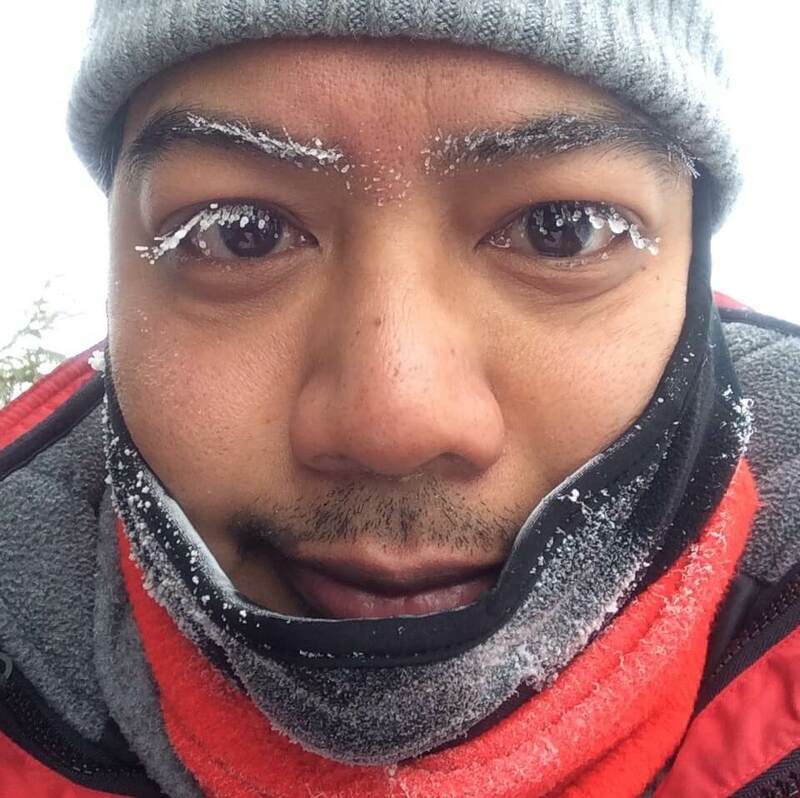 If you want to use a tripod, you’ll need to purchase an equipment permit for $10, valid for the entire tour season. 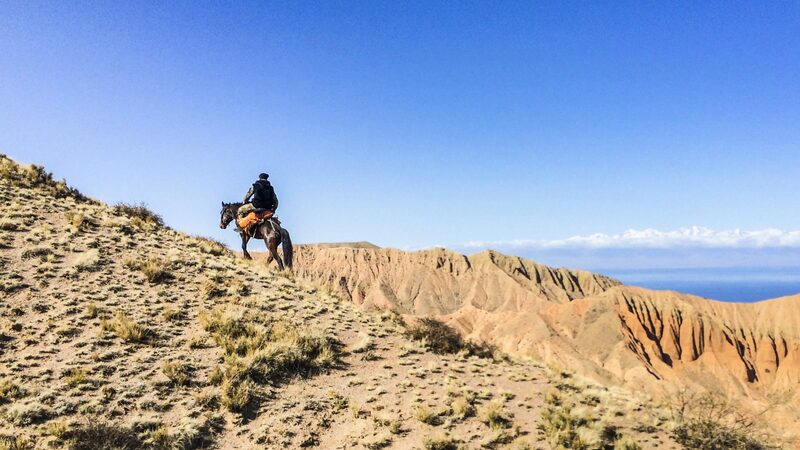 If you go early in the morning, you’re more likely to avoid crowds. 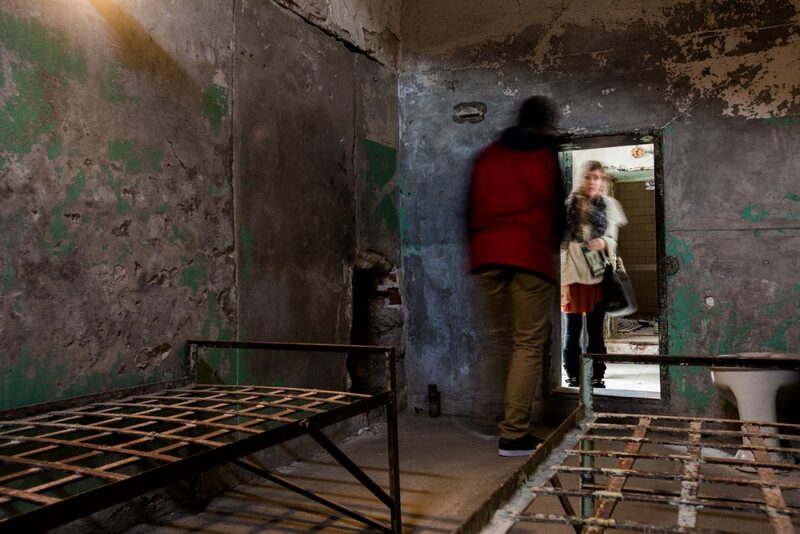 On May 5 2017, the prison’s abandoned hospital block opened for the first time to visitors. There are 15-minute tours scheduled throughout the day, included in the admission price. 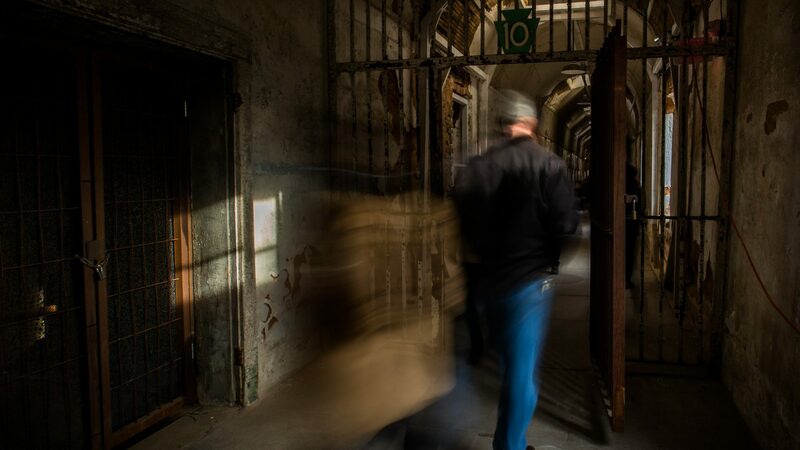 If you love a good scare, don’t miss ‘Terror Behind the Walls,’ a slickly designed haunted house (slash prison fundraiser) with Eastern State as its horrifying backdrop. Considered one of the best haunted houses in America, you can decide whether to watch the terrifying action or be an active participant in its six attractions. Tickets are cheaper online, ranging from $25-50 per person. 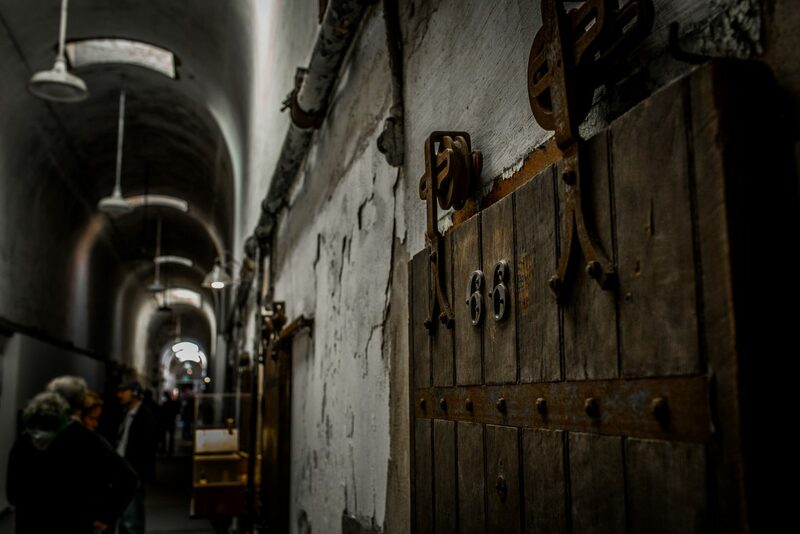 Historical information taken from The Eastern State Penitentiary audio tour and website. 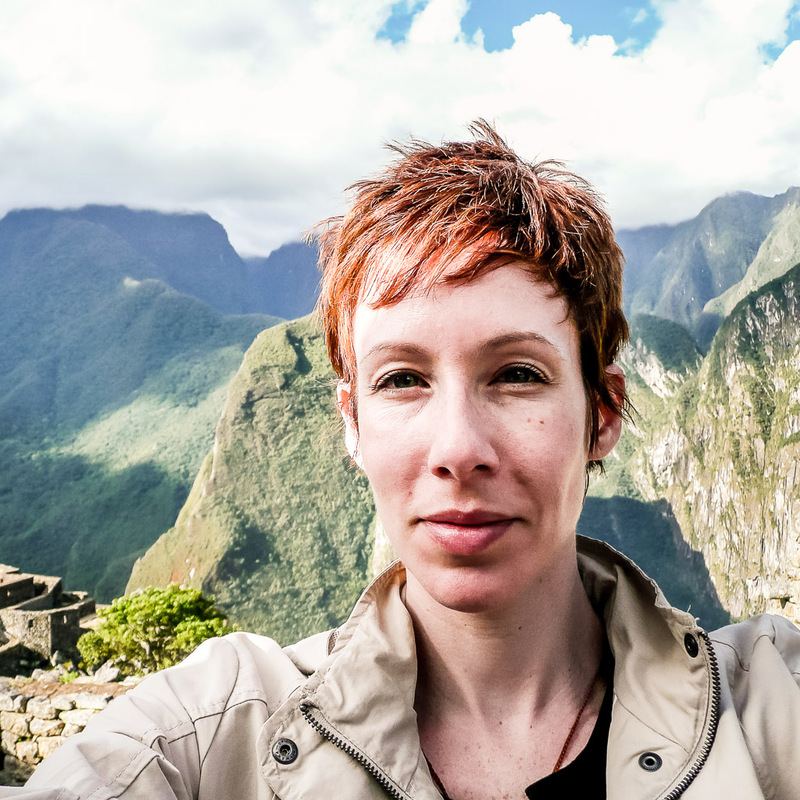 Susan Portnoy is an award-winning photographer and freelance travel writer as well as the creator of The Insatiable Traveler. 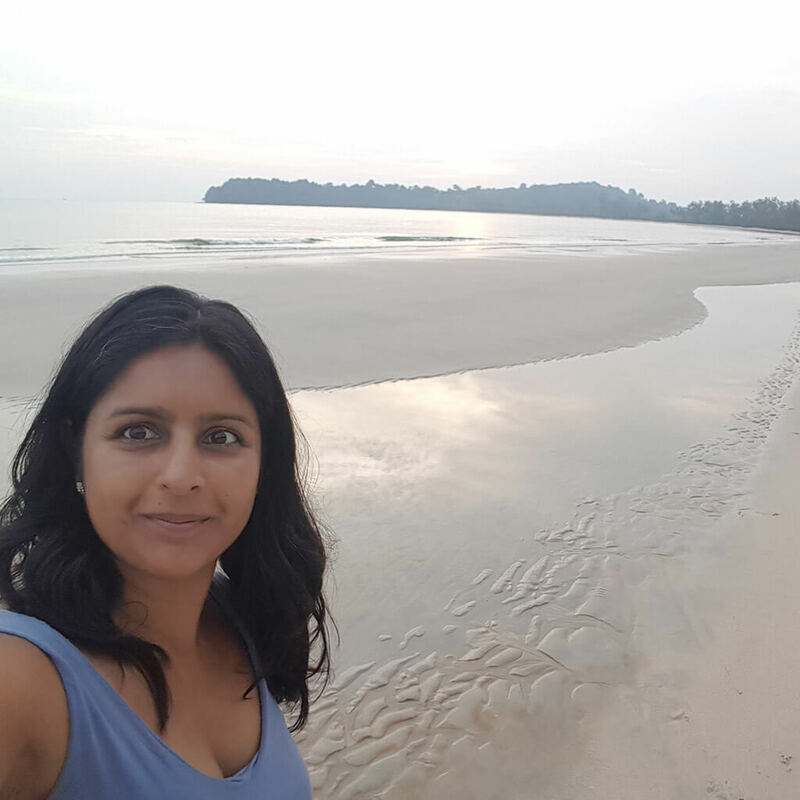 Her work has appeared in USA Today, Mashable, The Globe & Mail, and Today.com, among others. 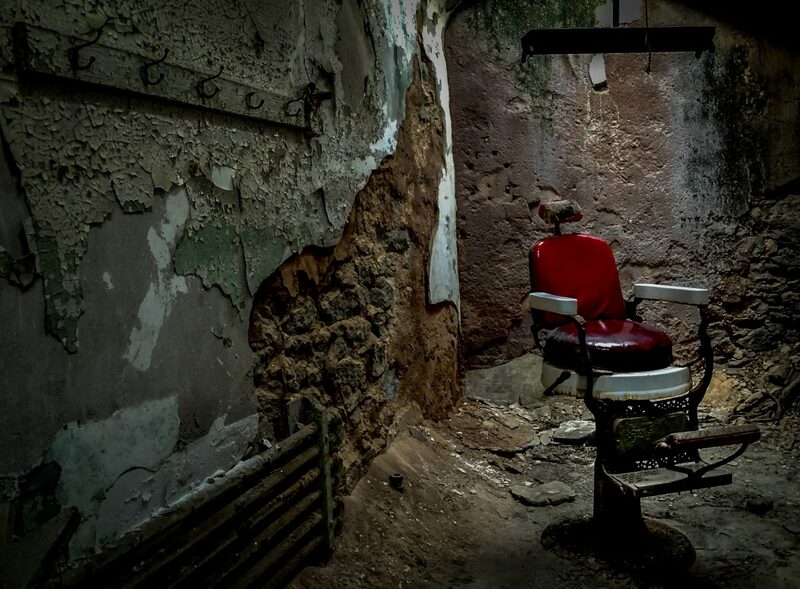 Dark tourism: Why is it important?